Was born in 1841, and educated at Christchurch, Oxford. Like Lord Brassey, he is an authority on navigation, and his yachting experiences, dating back to college days, have been of the most varied and important characters. His first boat was Cripple, 33-ton cutter, and he was then a member of the Royal Cork Yacht Club. It was not till 1887, however, that he displayed an active interest in racing. In that year he sailed on board Mr. John Jameson’s Irex, and thereby was largely influenced in pursuing the brilliant racing career which, coupled with the three Valkyries, made his name famous in yachting history. In the year following his racing on board Irex he built the 60-rater Petronilla, designed by Mr. Alexander Richardson, and built by Fay and Co. ; but she was a comparative failure, only winning nine flags out of twenty-eight races. 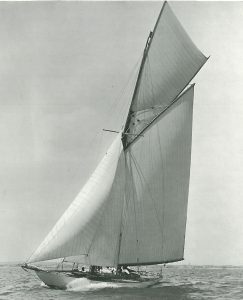 In the same year, however, he commissioned G. L. Watson to design a challenger for the America Cup. Valkyrie I, was the result, being built by Fay and Co.
Valkyrie I. Earl of Dunraven. In March, 1888 the Royal Yacht Squadron, on Lord Dunraven’s behalf, challenged for the cup, and the challenge was accepted, though upon that body insisting that the cup, if won, should be held under the deed of gift of 1887, the challenge fell through. Valkyrie I. was one of the finest cutters of the day. In the racing of 1899 she won twenty-three prizes in thirty-three starts, there being fourteen first, eight seconds, and one third. Lord Dunraven in this year also raced the 2½-rater Cosette, which won eleven prizes out of nineteen starts. In 1890 Valkyrie I., with Diaper as sailing-master, did not do so well, winning only eleven prizes against Thistle’s twenty-two and Iverna’s twenty. 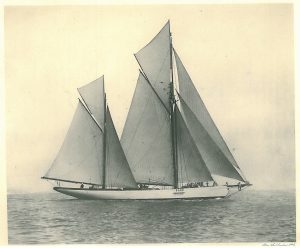 Payne, however, built for him the 5-rater Alwida from the design of Mr. A. E. Payne, and she won thirty flags during the season. In 1891 A. E. Payne was commissioned to build for Lord Dunraven the 62-rating cutter L’Esperance for cruising purposes. Payne also built for him the 5-rater Cyane. In the summer of 1892 Lord Dunraven again entered into negotiation with the New York Yacht Club, and having succeeded in removing the deed of gift obstacles, the Royal Yacht Squadron challenge was accepted, and Valkyrie II. was built for the challenge. She made an excellent show in home waters before being taken over, winning eleven first and four seconds, and beating Britannia and Satanita. The story of the America Cup races, including the Valkyrie II, and III., is told elsewhere. To Lord Dunraven belongs the distinction of having furthered the progress of yacht construction to a very great extent, and also for having placed upon a satisfactory basis the conditions relating to America Cup challenges. 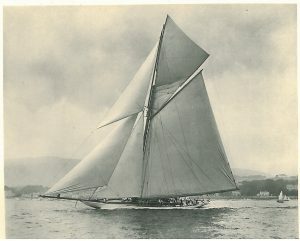 Lord Dunraven’s first challenger, Valkyrie I., was raced and won all the prizes in the Mediterranean in 1892, and was eventually sold to an Austrian owner, and Valkyrie II. was sunk in collision racing on the Clyde. L’Esperance was sold by Lord Dunraven to Prince Henry of Prussia. Deirdre, 20-Rater. Designed by G. L. Watson in 1893 for the Earl of Dunraven, and now owned by Messrs. E. Dezilles and A. Celiot. In Lord Dunraven’s fleet of yachts are also included numerous small raters and the 20-raters Deirdré and Dragon III., and in 1895 his lordship designed, and Messrs. Summers and Payne built, the Audrey, a very successful racer for several seasons. In 1895, also, Messrs. Summers and Payne built the Cariad, ketch, 120 tons, which won for Lord Dunraven the Vasco da Gama Cup at Lisbon in 1898. 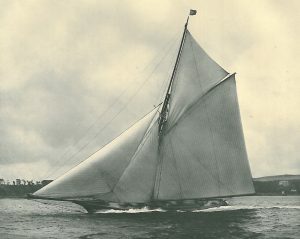 She was sold, and in 1902 Messrs. Summers and Payne built for Lord Dunraven a second Cariad, a ketch of 152 tons, which he still owns, and which won the King’s Cup at Cowes in 1905. Lord Dunraven also owns the 16-tonner Boneen. 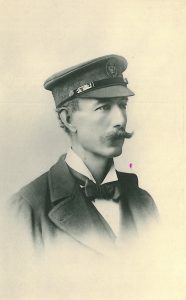 Lord Dunraven holds an extra master’s certificate, and is author of ‘Theory and Practice of Navigation,’ published in 1900, and of which a second edition has been published. Though retired from racing, he still devotes much energy to the encouragement of yachting, and he is Commodore of the Bristol Channel Cruising Club and of the Castle Yacht Club. Clubs: He is a member of the Yacht Racing Association. Clubs Royal Yacht Squadron, Bristol Channel Cruising, Clyde Corinthian, Castle, New Thames, Penarth, Seaview, Royal Victoria, etc. Residences: 10, Connaught Place, Hyde Park, W. ; Kenry House, Putney Vale, S.W. ; Dunraven Castle, Glamorgan ; Adare Manor, Adare, co. Limerick.